It’s not unusual for artists to have started off studying medicine, and the French Impressionist Frédéric Bazille (1841-1870) came close to qualifying as a doctor. It has been suggested that the great Dutch landscape painter Jacob van Ruisdael (c 1629-1682) may have also been a physician, but most would now consider that to have been a case of mistaken identity. Although Thomas Eakins studied anatomy, he did so as an aid to his figurative painting, without any intention of progressing to become a doctor. 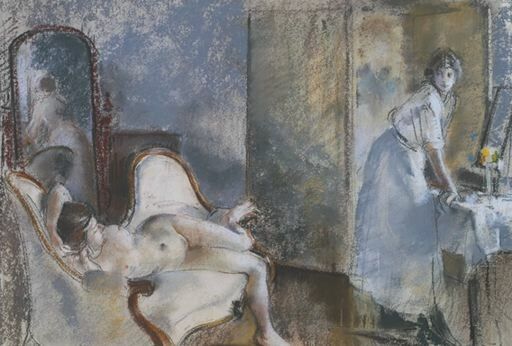 The one exception is the remarkable Henry Tonks (1862-1937), who was a fully-qualified surgeon and anatomy teacher, and later became a significant painter and the Slade Professor of Fine Art. He was born in Solihull, Birmingham, England, and studied medicine from 1882 to 1886. He qualified as a surgeon (completing postgraduate specialist training) in 1888, and worked as a surgeon at the Royal Free Hospital in London from that year, additionally teaching anatomy at the London Hospital Medical School from 1892. Before achieving his surgical qualification, in 1887, he started to study at the Westminster School of Art. By 1891, his paintings were good enough to allow him to exhibit for the first time at the New English Art Club, to which he was admitted as a member in 1895. He painted A Girl with a Parrot (c 1893) at about the time that he abandoned surgery and became a full-time artist and teacher. A small and intimate glimpse into the private world of a young girl, this shows his very painterly and gestural style, influenced by Whistler and Impressionism, but with his careful draughtsmanship. 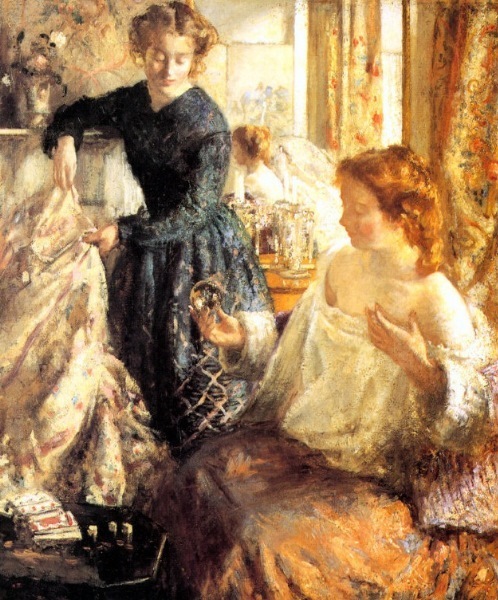 Henry Tonks (1862-1937), The Torn Gown (1890-1900), oil on canvas, 87.2 x 72.1 cm, Southampton Art Gallery, Southampton, England. Wikimedia Commons. 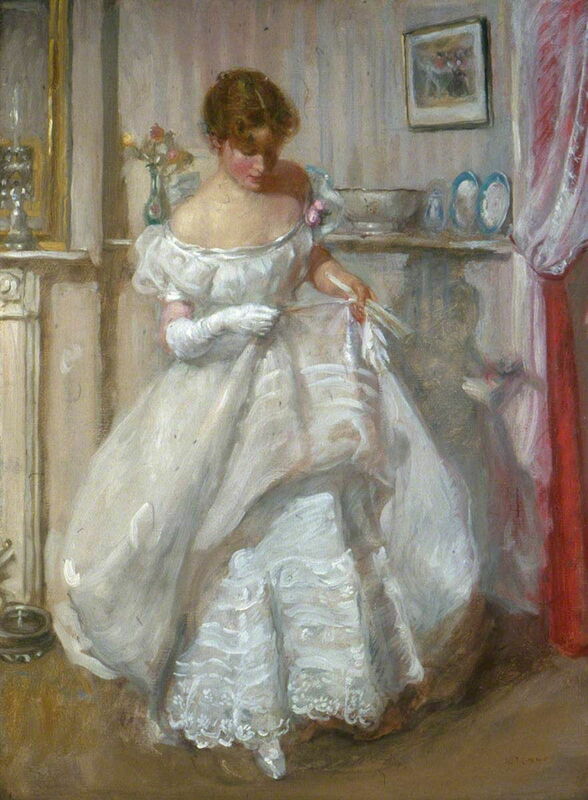 The Torn Gown (1890-1900) is one of a series of paintings dominated by white dresses, in which the free brushstrokes he used for fabrics and decor became carefully controlled when he painted the figures themselves. This concern for draughtsmanship skills and adherence to underlying anatomy was reflected in the traditional curriculum at the Slade School at the time. 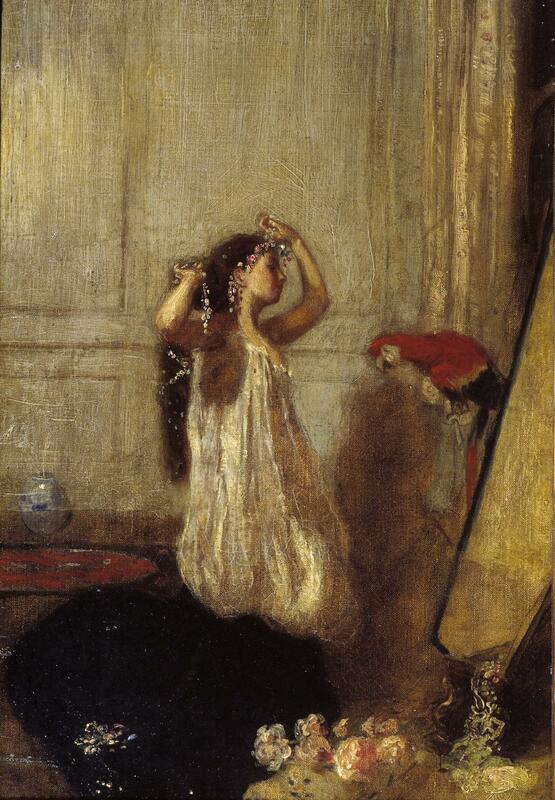 Henry Tonks (1862-1937), Matinee Rehearsal (c 1900), further details not known. Wikimedia Commons. 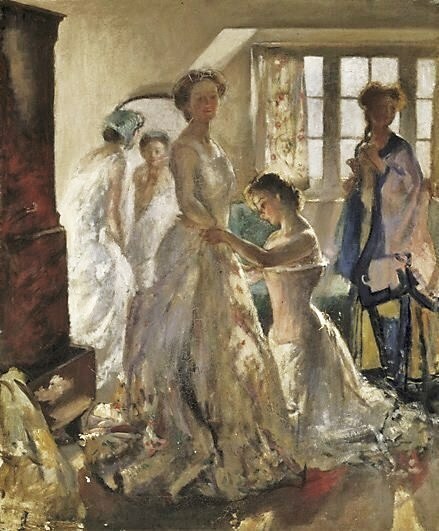 Matinée Rehearsal (c 1900) is another in this series, here set in the improvised dressing room of an amateur stage production – an ingenious opportunity to explore the interaction between human form and the flounce of fabric. His Rosamund and the Purple Jar (c 1900) is a simple narrative taken from a popular series of moralising stories for children, written by Maria Edgworth in the early 1820s. Rosamund needed a new pair of shoes, but instead of buying them, she spent her money on a large glass jar filled with purple liquid which she saw in a shop window (in fact, one of the stock symbolic products of a chemist/pharmacist). At first delighted, she then realised that she would be unable to go out, because her old shoes were too uncomfortable to wear. It is noticeable that this oil painting, little more than a hundred years old, has already suffered from extensive and very visible cracking, suggesting that Tonks’ materials or techniques were less than ideal. I find this puzzling, as he was known for his emphasis on the teaching of technique, and invented the method of ‘Tonking’. This is still used sometimes when excess oil, or a small area of wet oil paint, is to be removed from a painting. Tonks taught how to do this using a piece of newspaper, which will blot away the oil (‘oiling out’) or wet paint. It remained popular into the 1950s, but with the decline in teaching of techniques in art schools, has now largely fallen into disuse. 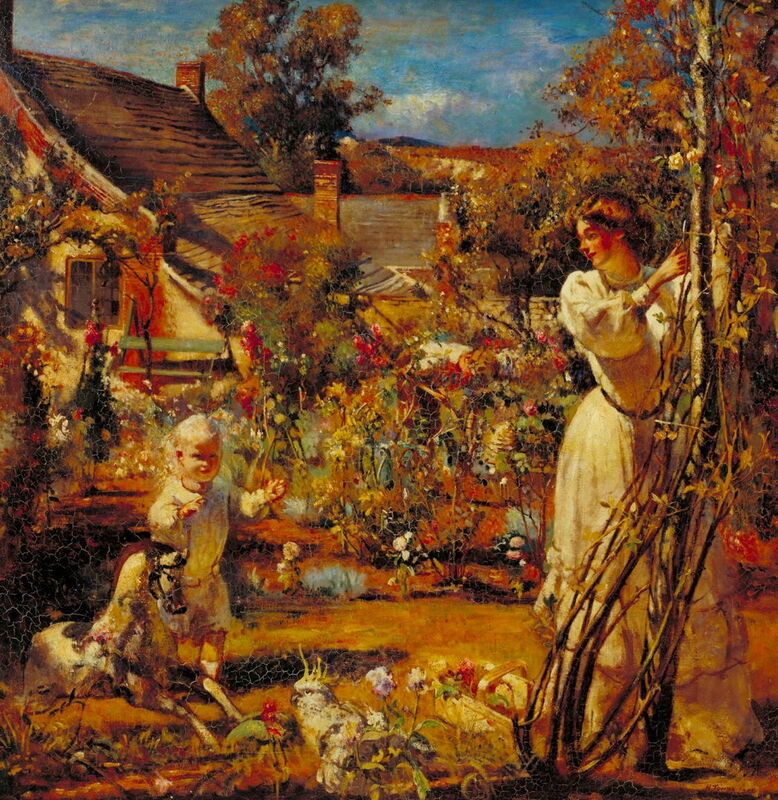 Summer (1908) is a dazzlingly rich and intricate view of the garden at Arfleet, near Corfe Castle, Dorset, England. Using a real mother and her son as models, the boy’s rocking horse and a cockatoo are unusual objects to see in an English garden in summer. 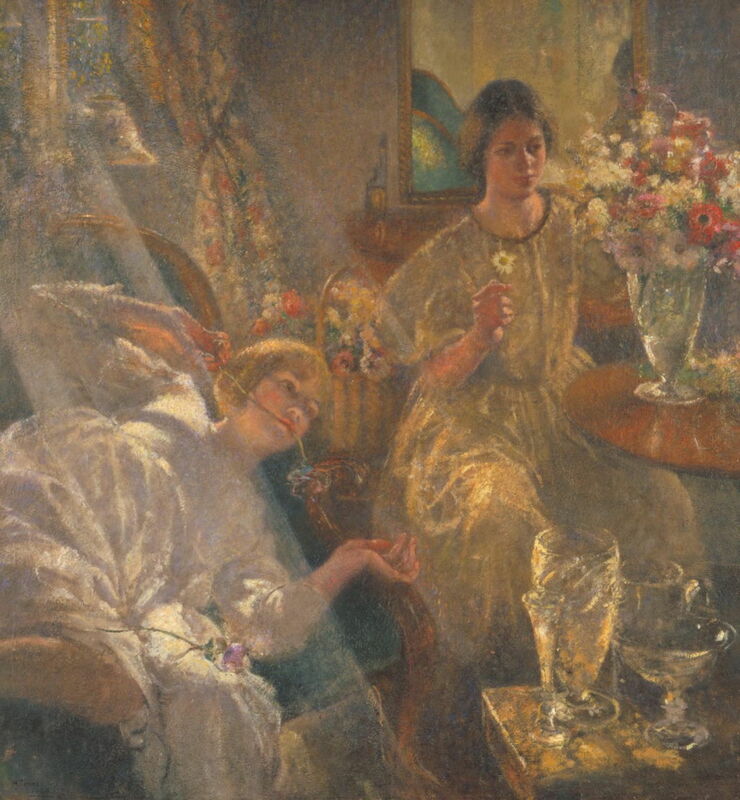 Henry Tonks (1862-1937), Crystal Gazers (c 1910), further details not known. Wikimedia Commons. Crystal Gazers (c 1910) continues his brightly-lit paintings of women. 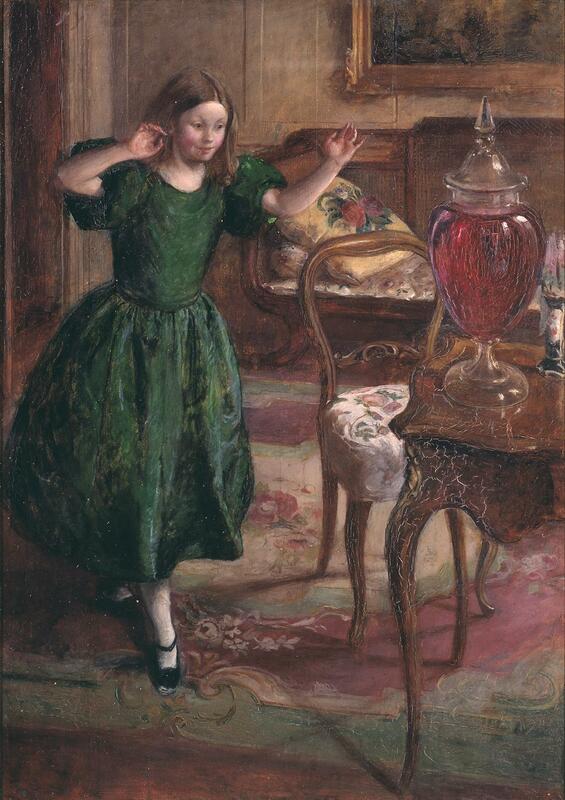 Here the figure in the foreground is staring at a crystal sphere, in the hope of seeing her future in its sparkling reflections. Henry Tonks (1862-1937), Walking on Sand (c 1910), further details not known. Wikimedia Commons. 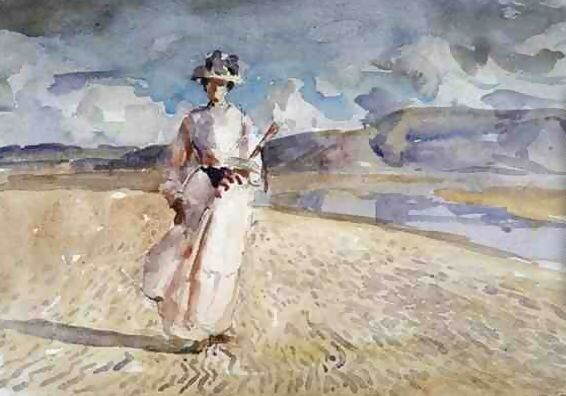 Walking on Sand (c 1910) is an example of his wonderfully loose watercolour sketches of this period. With his surgical career in the past, Tonks had the reputation of being quite a formidable teacher. He had great influence on many of his students, some of whom went on to successful careers in art – including Gwen and Augustus John, Stanley Spencer, Wyndham Lewis, Spencer Gore, Paul Nash, and Rex Whistler. However he did not get on well with over-confident young men, and was also known for his sarcastic wit. He was also a skilled pastellist, as shown in his The Toilet (1914), a theme which he painted on other occasions too. With the outbreak of war in 1914, Tonks returned to medicine, working first at a prisoner of war camp in Dorset, then in Essex. He painted Auguste Rodin, the sculptor, and his wife when they were refugees. 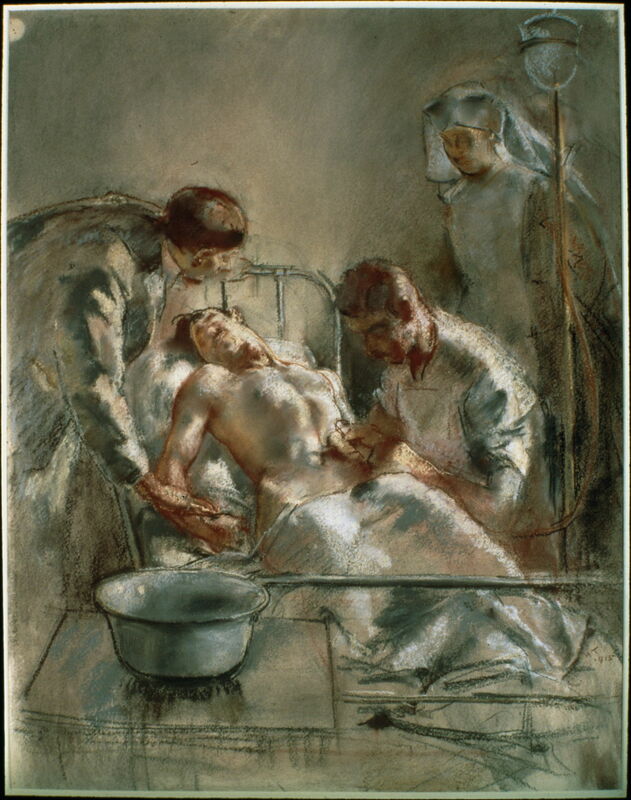 Henry Tonks (1862-1937), Saline Infusion: An incident in the British Red Cross Hospital, Arc-en-Barrois, 1915 (1915), pastel, 67.9 x 52 cm, The Imperial War Museum, London. Wikimedia Commons. The following year, Tonks served as a medical orderly (a remarkably low role for a former surgeon!) on the Marne, France, where he used his pastels to paint Saline Infusion: An incident in the British Red Cross Hospital, Arc-en-Barrois, 1915. Saline intravenous infusions were still relatively novel at that time, and war surgery was busy re-learning many of the lessons of the past. Tonks preserved the anonymity of his models although his drawing is otherwise anatomically precise. Tonks was finally commissioned as a Lieutenant in the Royal Army Medical Corps in 1916, and then worked with the pioneer plastic and reconstructive surgeon Harold Gillies, documenting mutilating facial injuries in a unique and often harrowing series of pastels and sketches. 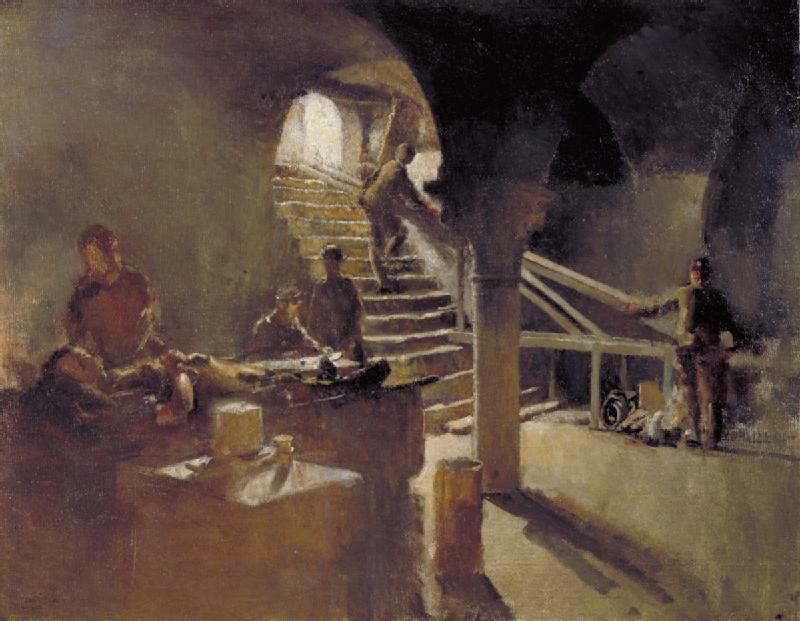 It was not until 1918 that Tonks became an official war artist, painting a cellar being used to receive and assess the wounded in his An Underground Casualty Clearing Station, Arras (1918). 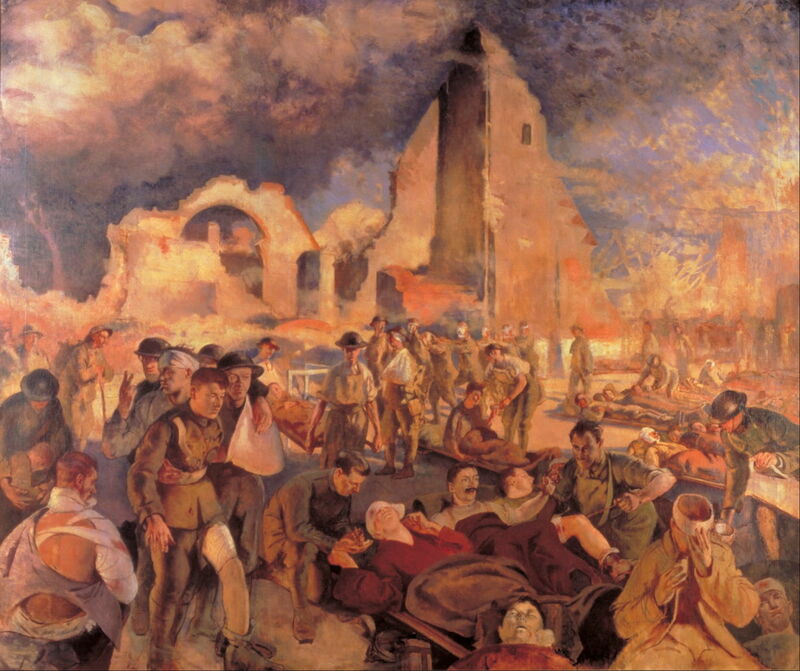 Perhaps his most important painting is that of An Advanced Dressing Station in France, 1918, which compares with John Singer Sargent’s Gassed (1919) in its near-documentary depiction of an ad hoc medical facility not far from the front line, and the apocalyptic vision of war. For much of the final phase of the war, Sargent and Tonks travelled and worked alongside one another. Gassed is a studio painting which Sargent composed from his notes and sketches made at this dressing station, and Tonks’ painting is a more literal depiction of conditions in the dressing station itself. Both paintings were commissioned by the British government. After this, Tonks was appointed the Slade Professor of Fine Art, but only after he had given Walter Sickert the opportunity of the post. Before the war he had opposed Roger Fry’s promotion of Post-Impressionism; after it he settled into his own war against Fry and the rising tide of modernism which Fry represented and promoted. Tonks was apparently never entirely happy with his Spring Days (1926-8), and repainted it several times using different models. Gone is his overall lightness, narrowed into the shafts of sunlight coming through the window. Several of his post-war works show groups of ageing artists who seem to be whiling away their later years. 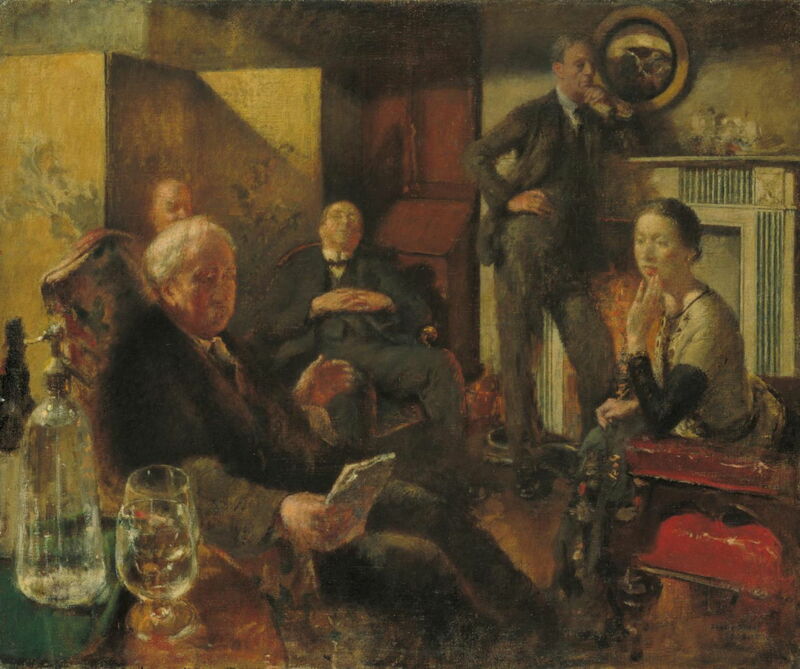 Saturday Night in the Vale (An Evening in the Vale) (1928-9) shows the Irish author George Augustus Moore (seated in the foreground) reading from the manuscript of his latest novel to a gathering in Tonks’ studio, The Vale, in Chelsea, London. Seated at the far left is St John Hutchinson (barrister and politician), dozing in the armchair is Philip Wilson Steer (painter and teacher at the Slade), Tonks is stood by the fireplace, and Mrs Mary St John Hutchinson is seated at the right. Mrs St John Hutchinson was the mistress of Clive Bell, a friend and ardent supporter of Roger Fry and modernism. Inevitably Tonks’ friends were critical of their depictions, and the artist took a year to complete this version, only to paint another attempt after his retirement as Slade Professor in 1930. 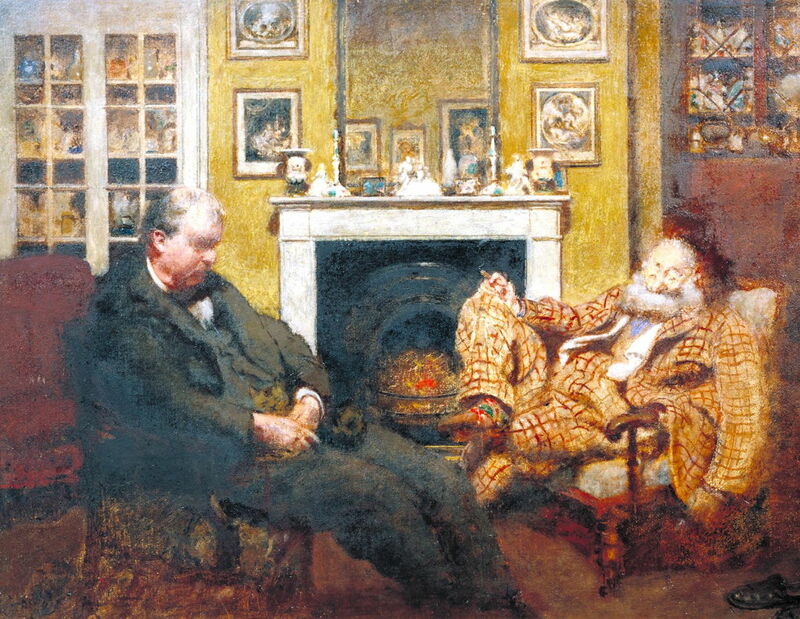 Sodales – Mr Steer and Mr Sickert (1930) is in a similar vein, this time showing Philip Wilson Steer dozing when Walter Sickert was visiting him at home in Cheyne Walk, London. Tonks continued his fight against Fry and modernism, and in 1936 the Tate Gallery honoured him with an exhibition of his work – only the second such retrospective for a living British artist. Tonks died the following year. Posted in General, Painting and tagged Fry, painting, Sargent, Sickert, Tonking, Tonks, war artist. Bookmark the permalink.